My love for statement sleeves haven't disappear. And that is why I have chosen this baby pink top to wear during London Fashion Week. Paired with simple black leather jacket, A line skirt and ankle boots. 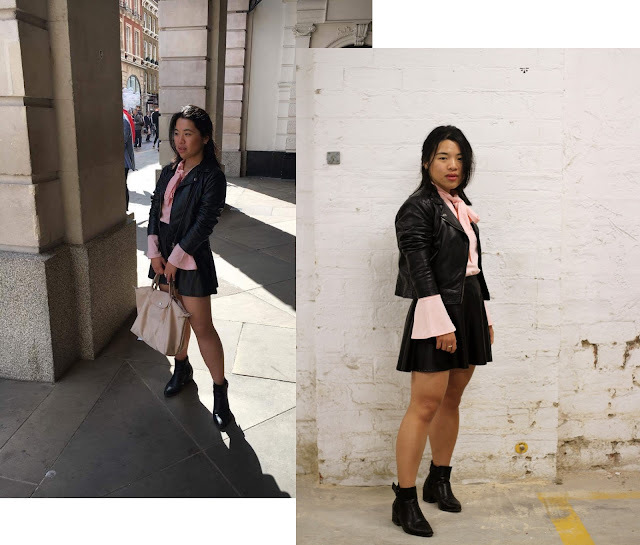 To emphasis the statement sleeves of the blouse, I have pull out my sleeves from leather jacket a bit p so the sleeves of the blouse would be more visible. Styling tip: Put a hair band or a rubber band above the crook of your elbow and push up the sleeve to scrunch over the hair/rubber band. This trick helps to hold the pull out sleeve hold in place. However, be aware of too tight rubber bands!